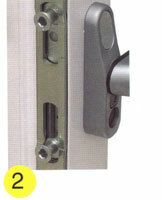 For information on Maco locks click here. The Bahama Windows range is attractive, affordable and more secure than most. We are part of Network VEKA, whose products are vigorously tested to make sure that they comply with important quality standards and have been rewarded the coveted Secured by Design accreditation. This recognises and highlights products which incorporate effective crime prevention at the design stage. 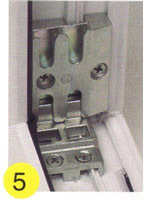 MACO locks, on all of our VEKA products, offer first class security. Behind the MACO Secure scheme is a substantial investment in research and development into the design of components and the specification of the materials that are used in their production. On the surface, it all looks very simple, but it is just that which creates such an effective solution. 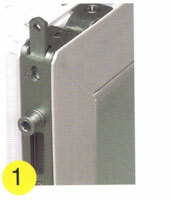 The Shootbolt (1) is a steel bolt sliding out from the corners of the opening edge (top and bottom or left and right, dependent on how the window is hinged). This gives added security by locking on opposite sides of the mushroom bolts. The Mushroom Cam (2) is a method of creating a high compression locking seal that is virtually impossible to slide or break apart. High-grade steel precision-engineered components have withstood the most rigorous testing, far over and above the standards required. 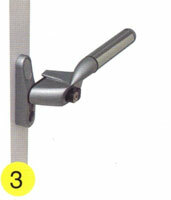 The Handle (3) is designed to provide a lightweight but positive action. Fitted with a push to open button, not only is it stylish but an integral part of the overall security capability of the window. The Striker Plate (4), or the housing in which the Mushrooms and Shootbolts locate into, are designed specifically to fit the window ensuring maximum integrity in the security arrangement between strike and locking point. The combined Shootbolt and Mushroom Striker Plate (5) in the corners of the window are designed to provide optimum levels of security to the vulnerable corners of the window. Throughout the manufacturing and fabricating procedures, MACO ensures that a continued process of testing is carried out to maintain the hard won industry certification standards, both by itself and its commercial partners. You have a choice of the look, shape and variety opening styles - and of course you can make more your windows more resistant to intruders.